Land-lovers can always find a grassy bank to moor at for a wander. 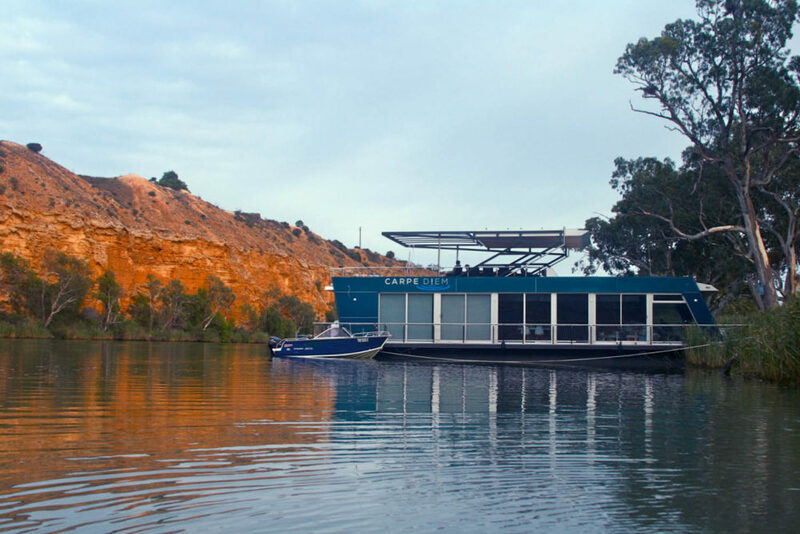 We’ve found a Murray River houseboat as luxurious as an actual house, offering freedom, thrills, and a deliciously slow pace of life. We ask, is there a better way to cruise a stunning stretch of this iconic river? A lack of sailing experience and my love of creature comforts have always cast a feeling of trepidation over a particular dream of mine: that of slowly making my way down the Murray River’s serene, gum-lined shores by houseboat, mooring where I please, and taking in the surrounding beauty with the occasional flick of a wheel. It’s always seemed like a wild flight of fancy. But there are houseboats, and then there are houseboats. Ultra-luxe, fully appointed and with thoughtful architectural details, the Carpe Diem, my home away from home for the next few nights, is the kind of vessel you’d trade your own house for. 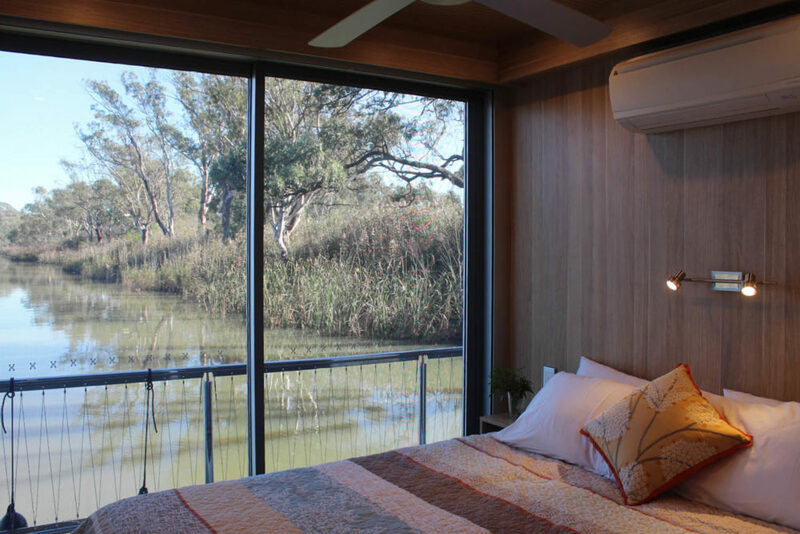 “The idea was to give it a yacht feel,” says Martin Altman, who, along with fellow Murray River locals including designer Mark Reu, crafted the modern two-storey, three-bedroom, sharp-lined abode, with floor-to-ceiling glass windows to take in the sweeping views. Our journey begins in Younghusband, an easy one-and-a-half hour’s drive from Adelaide through the hills and wine country, before the terrain gets drier and more desert-like, setting the tone for our journey down the river. The area is part of the Lower Murray, a vast region extending from over the border of New South Wales to just south of Adelaide, where the country’s longest river finally meets the ocean from its source in the Australian Alps. End to end, the Murray traverses some 2700 kilometres. Before railways were constructed, the river was the main way to transport goods across this vast land. 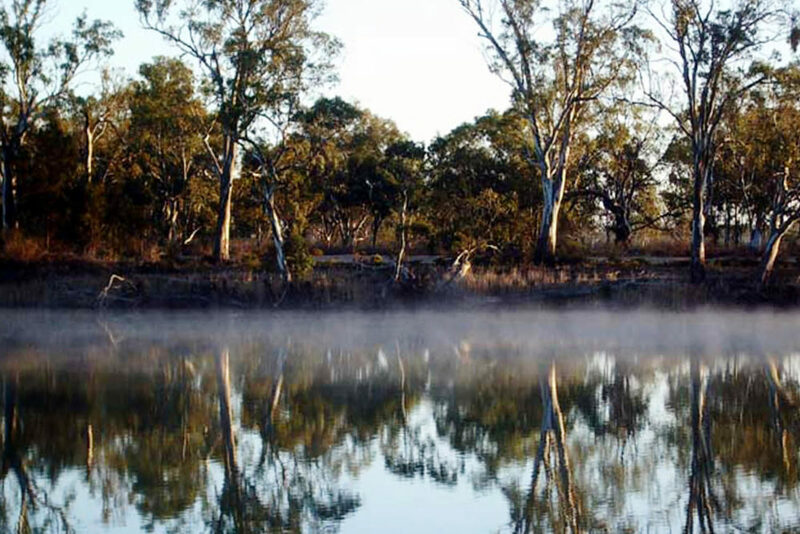 Even with a long hire of one to two weeks, heading all the way up to Blanchetown where this stretch meets a weir, you only see a fraction of the river, but Martin handpicked these South Australian bends for their one-of-a-kind Murray River beauty: dramatic sandstone cliffs, picturesque river ports and abundant wildlife. In the Dreamtime stories of the local Ngarrindjeri, the great fish Pondi created the river’s signature curves as it was chased downstream. Truth be told, we are anxious as we pull out of the marina; we’re fully in charge of the five-tonne, million-dollar-plus Carpe Diem with not a shred of experience (surprisingly, all that was needed was a valid driver’s licence and a quick lesson with the marina managers before the keys were handed over). But the river is wide, about 350 metres from bank to bank, particularly at the marina. 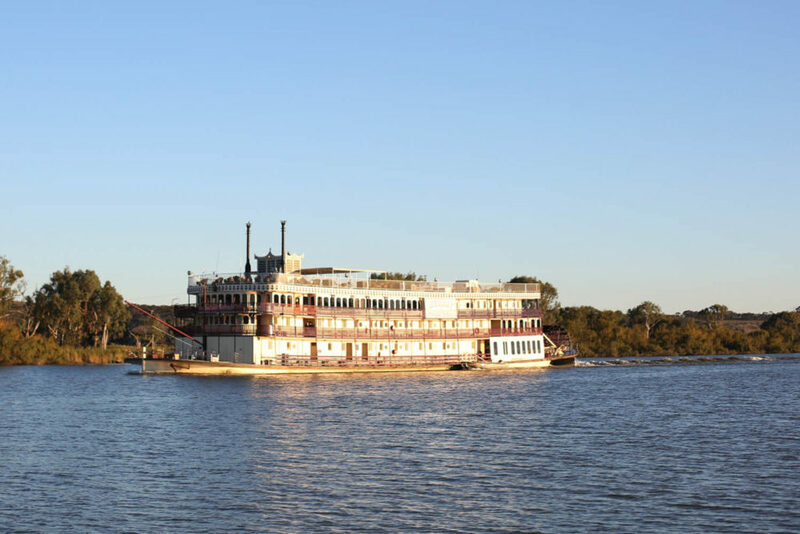 The PS Murray Princess, the largest inland paddle steamer in the southern hemisphere, comfortably cruises by, along with a raft of iconic historic steamers, fellow houseboats and even the occasional seaplane, which we see take off and land on the river runway. It’s a thrilling feeling to be the captain of your own vessel, veering right according to maritime law and following the horn signals of the river that you’ve just learned about. Even at full-throttle, we’re moving relatively slowly. The average houseboat travels at five to seven kilometres per hour, but the Carpe Diem is impressively responsive for something so big. Shifting the boat’s pace becomes a breeze, and before long we’re switching between skippering the vessel from the wheel on the top deck, the wind whipping at our faces, and the one found on the main floor. The slow speed proves to have many benefits. For one, it allows you to take it all in: the atmospheric willow trees gently swaying in the breeze; the pristine water, unimaginably smooth and still in parts; flocks of birds dancing in the sun including pelicans, black swans, sulphur-crested cockatoos, a wedge-tailed eagle… As the sun sets on our first night, docked on the river bank between two sentinel gums, we feel a sense of calm and quiet we’d long been missing. The next morning, the downtime continues, this time enforced, as the fog, too thick to navigate through, slowly dissipates. Summer holidays are the most popular time of year on the river, when people take to the water in kayaks and on jet skis (available for hire at the marina), and vessels like the Carpe Diem are flooded with fresh air and sunshine. 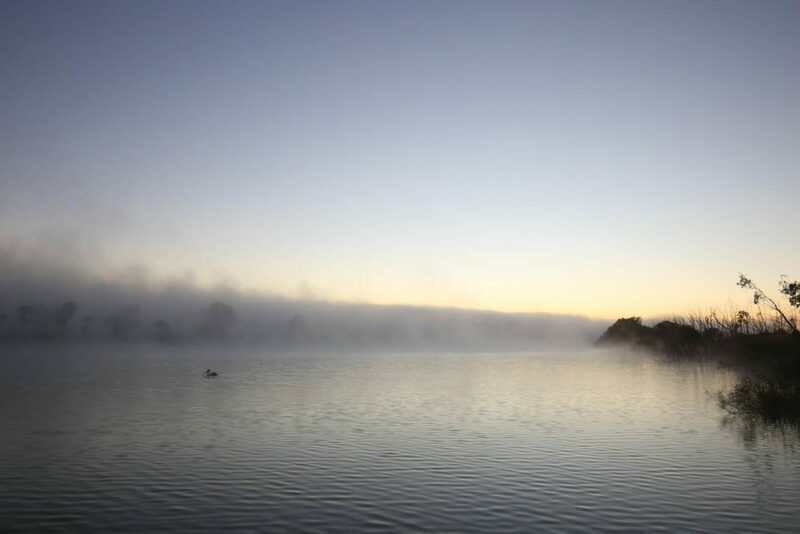 But there’s something to be said for the cooler months too, when the morning mist adds a striking beauty and fires on the riverbank can be enjoyed into the evening. We spend a few hours cruising down the river, passing by townships of ‘shacks’ – South Australian cheek for holiday houses, be it caravan, shanty or designer home – and stray cows from neighbouring farmland, before it’s time to moor again. The pleasure of house boating is as much in stopping as it is in moving, and choosing where next to temporarily call home takes much consideration. Tonight, we pull up in front of sheer yellow cliffs studded with giant succulents, which cast a perfect reflection on the water. We prepare a barbecue off the end of the boat, the stone tableau our vista, and dine in the upstairs entertaining space. 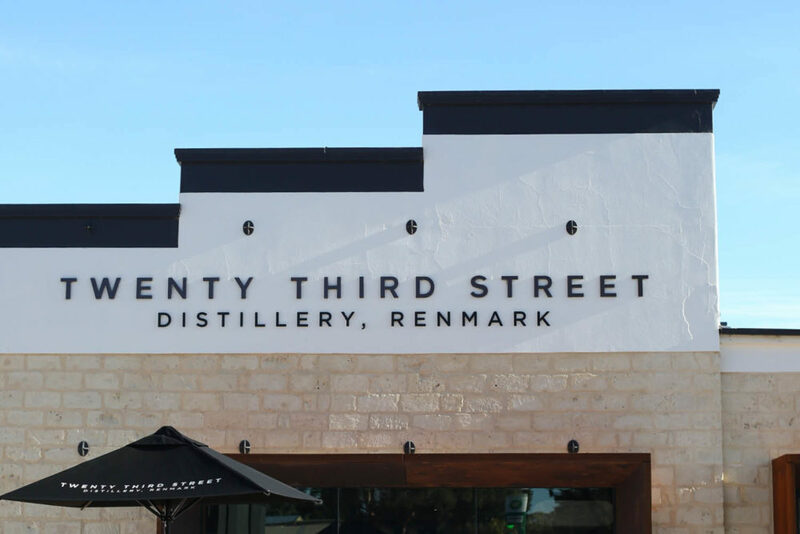 To the north-east is Riverland, while the south-west serves up the Barossa, Adelaide Hills and more. Upon request, the Carpe Diem can be stocked with the region’s lauded wine and fresh produce. The houseboat has a slick, downstairs galley kitchen to prepare your food, and there are dining (and drinking) nooks dotted throughout – perfect for enjoying gourmet cheeses, bread and antipasto. The famous Murray River cod can also once again be found in healthy numbers and keen fishers can make the most of the fresh supply. Guests often pick up goods at Bowhill and those who journey further upstream stop for a pub lunch at Swan Reach too, jumping off their boats along the way to explore small lakes and hilltops that they spot as they drift by. Reluctantly, at Purnong, north of Bowhill, we turn around and head back to the marina. Our journey has been short compared to the standard three-to-four night trip, or the weekly hire that groups of friends or families usually take (the Carpe Diem accommodates up to 10 in comfort), but we’re already planning our return. 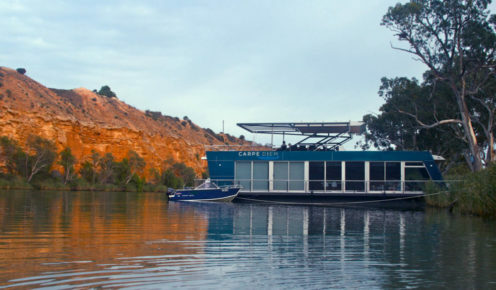 Cruising down the Murray is pure magic, and we’re hooked, line and sinker. Getting there: Younghusband is a one-and-a-half hours’ drive from Adelaide. Carpe Diem departs from the Kia Marina. Playing there: Carpe Diem – Pricing is seasonally based from $3400–$5500 per week; shorter hires available.